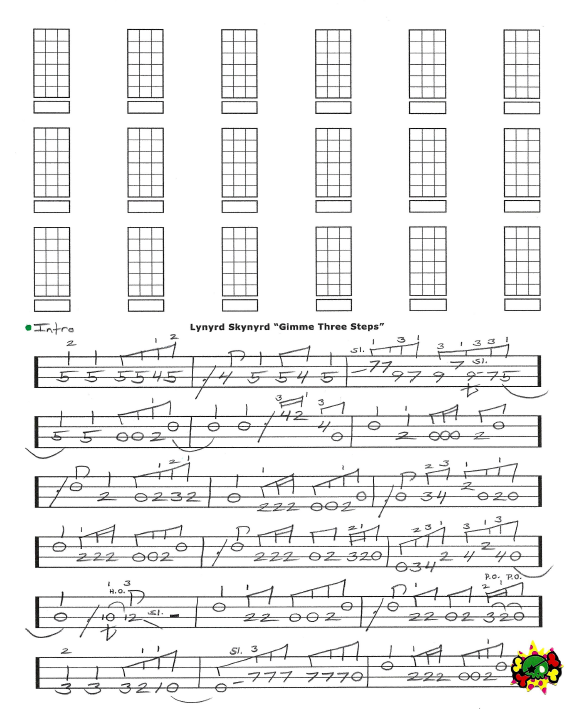 Lynyrd Skynyrd Gimme Three Steps Free Bass Tab by Jeffrey Thomas. Learn all the great licks from this classic southern rock track. I am following the studio version and have all the great licks on paper for you. I am pretty sure the bassist used a pick but none of the lines require it. Want the full bass tab for free? Send in your email using the form provided. Looking for online bass lessons? Fill out the Schedule A Free Lesson form to set up your free Skype bass lesson today. “Gimme Three Steps” was based on a real-life experience Ronnie Van Zant had in a biker bar in Jacksonville. He had a gun pulled on him for dancing with another man’s woman….Yee Haw! Find more cool, free online bass tabs on my blog, video and tab pages.